From an album with 12 illustrations of love stories This mitate-e (“travesty”) is also a reference to a real historical event in kabuki theatre, the murder of the woman-servant Osayo (Fuji). The name of the main character can be recognized in the three bold characters “Ichinoya” on the screen and the lettering decorating the robe. Behind the byobu (screen) the ghost of Osayo, the murder victim, can be seen. Japan_48-127. ISHIKAWA Tomonobu (Ryūsen) (active 1680-1713): Ryūsen was at the same time woodblock master, writer and cartographer. He worked mainly on book illustrations as a follower of Moronobu, but also produced some black-and-white print sheets in horizontal ôban format, his most important contribution to woodblock art. This and the following leaf are from an album of twelve illustrations dating from the year Jōkyō 3 (1686). Six are by the hand of Ryūsen and six by FURUYAMA Moroshige (1684-1695), a pupil of Moronobu. They illustrate IHARA Saikaku’s novel „Kōshoku gonin onna“, „Five Sensuous Women“. The leaf in question bears Ryūsen’s signature in the form of his gō (artist’s pseudonym). To judge by the shape of the cartouche and the style of this and the following leaf, they come from the same album. Another impression of the first leaf is to be found in the Tokyo National Museum. The second leaf has not previously been published in any of the literature available to us. Both come from the collection of Friedrich Succo, the well-known woodcut researcher of the beginning of the century. which passes, while one is still starting after it. The relationship is already over. Japanese research has also failed to identify the content of the scene. Ryūsen may, however, have based it on an event from the Genji-monogatari, namely the attack at night of the jealous ghost of Princess Rokujō, who killed Genji’s secret mistress Yūgao in front of his own eyes. The carnation decoration on the girl’s robe, the ghost, and the night-time setting may provide sufficient references. Other elements should be noted. In this and the following leaf, the wheel, the Buddhist symbol of fate, appears on the robes of the people entering the scene. Snow crystals on the robe in the background, and the moon mentioned in the poem, remind one of the story of the Chinese orphan, Ryōto, who was so poor that he could not afford light for his nightly studies. Ryōto collected snow in front of his window, which reflected the light of the moon. As we know from other leaves, too, Ryūsen purposely interchanged phonetically similar characters. The two characters on the young man’s left knee may also be read as „Ryōto,“ thus referring to the persevering young man of the Chinese legend. ISHIKAWA Ryūsen is also the author of the Kōshoku Edo murasaki („The Purple Colour of Sensuous Edo“), for which FURUYAMA Moroshige created illustrations running to twelve album leaves. 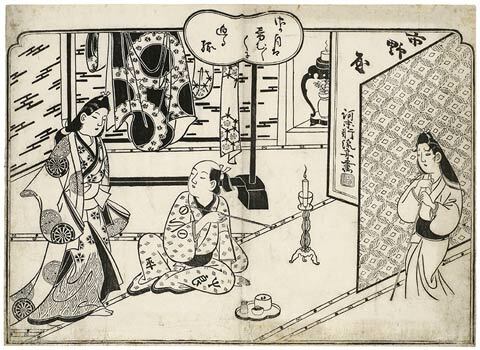 On a double page from the five-volume work owned by Mr. and Mrs. Hillier, we can see the considerable interdependence of both artists as far as the illustrations of keisei (courtesan) themes are concerned. Figures and their surroundings are proportional to each other. As in the leaf by Ryūsen described here, the artist Moroshige places his signature on an object within the picture, namely on the picture scroll in the tokonoma. The use of the same props is also of interest. There is an identically packed parcel, a toilet case, lying in the tokonoma of Ryūsen’s second woodblock, as in the aforementioned leaf by Moroshige. The black lacquered table with curved legs and inserted vase of flowers is repeated in another leaf by Moroshige in the Buckingham Collection, Chicago, in which the said toilet case also appears. Whether it is admissible to interpret the letters on the young man’s knees as also representing the artist’s signature – in a similar manner to SUGIMURA Jihei who sometimes signed his work in this way – is a matter of discussion. Both characters on the young man’s left knee in the reading „Ryōjū“ are perhaps another name for „Ryūsen“, while the character „hira“ could refer to Moronobu’s talented pupil Morohira (worked late 17th c/beginning of the 18th), who is chiefly known as an exceptional colourist.